I've had trouble in the past with liking to combine colors on faucets. It's always seemed to me an attempt of trying to hard to do something new. This spring, Blanco premiered their Purus II faucet with SILGRANIT II accents... I had already fallen head over heels for the Purus I with SILGRANIT II so the Purus II would be right up my alley! I'm not sure that there is a hotter color right now that the SILGRANIT II Truffle. It just screams warm and refined at the same time. 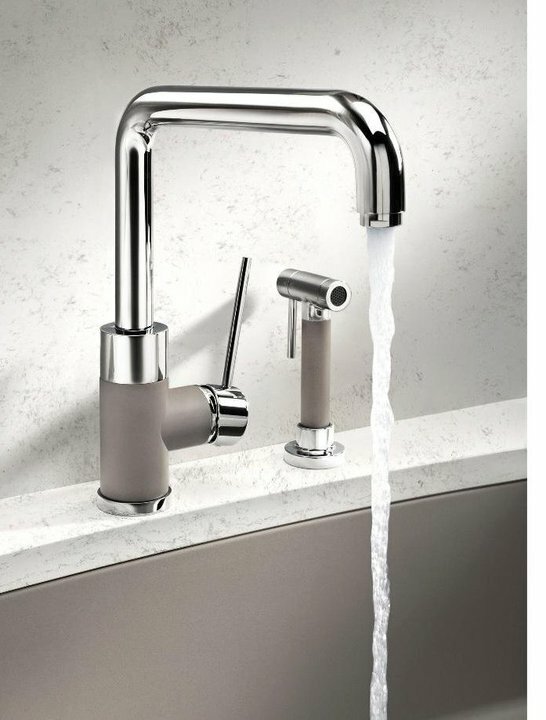 Perhaps most appealing about the SILGRANIT II accents on the Purus I and now II faucets are that the colors compliment the spaces around them and don't hog the landscape. 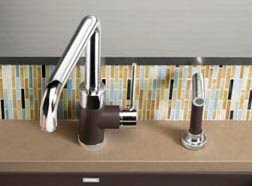 Many faucet manufacturers that are using accent colors are setting there pieces to be the center of attention. Sure, it works in some situations, but I love a piece that enhances the items around it. Notice above at how the truffle brings out the colors of the counter and splash. Genius! If you're not familiar with SILGRANIT II from Blanco, check it out. 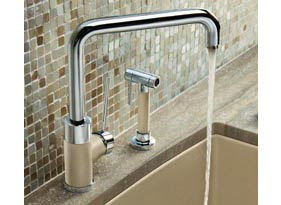 Solid SILGRANIT II faucets are available in some lines, while accents are only available on the Purus line. So what do you think? Would it work in your space? Yes, it would work in my space. But would it teach me Italian?